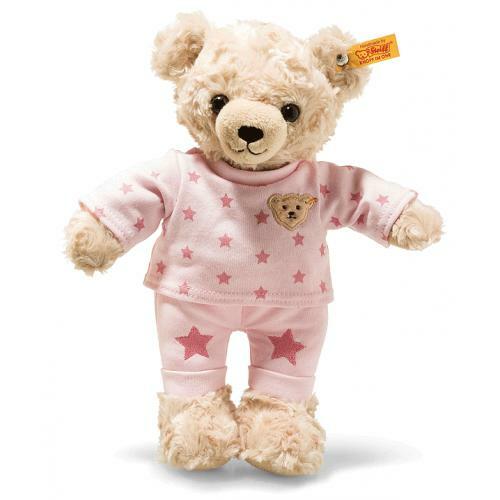 Steiff Teddy and Me Teddy Bear Girl with Pyjamas is made by hand, in the finest light blond and pink cuddly soft plush. Teddy and Me Teddy bear girl with pyjama is 27 cm tall and made from soft and cuddly light blonde plush fabric. His soles and paws provide a beige contrast. Careful stitching was used to create his nose and mouth. 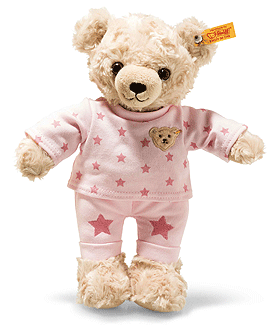 The pyjama consists of a pink T-shirt with dark pink stars printed on it and a stitched-on Teddy bear patch in beige. Her pink pants are permanently sewn-on and have two lovely stars embroidered on them.